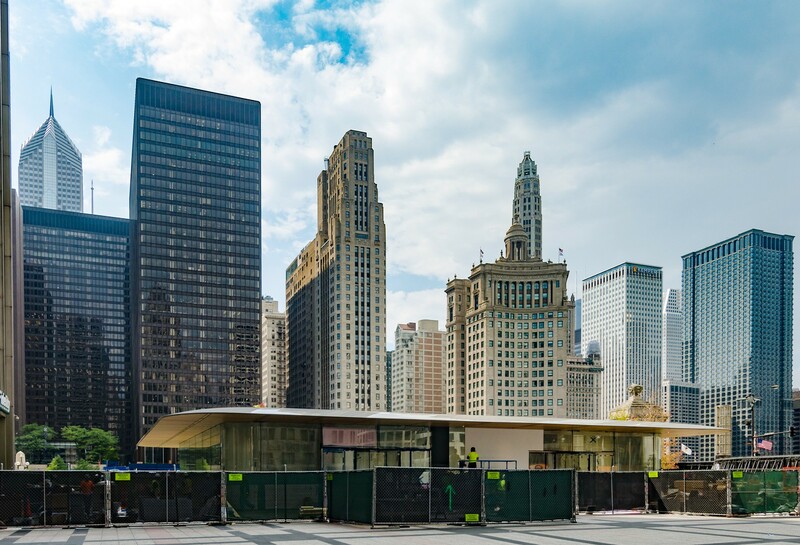 One of Mies van der Rohe’s final designs rises above a former rail yard that many years earlier was the site of Fort Dearborn. In 1803, Fort Dearborn was built on the south bank of the Chicago River, becoming the U.S. Army’s westernmost post in the early 19th century. 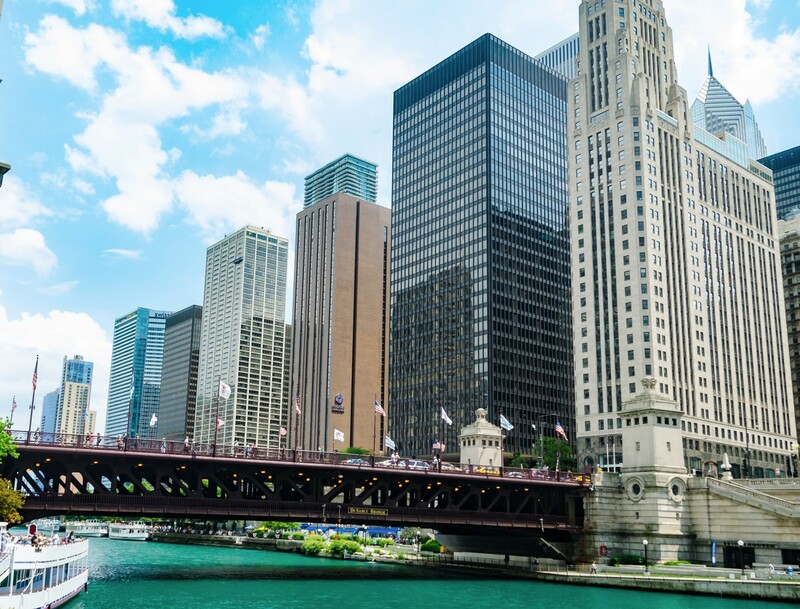 The landmark fur trading post established Chicago’s core and early pattern of growth. 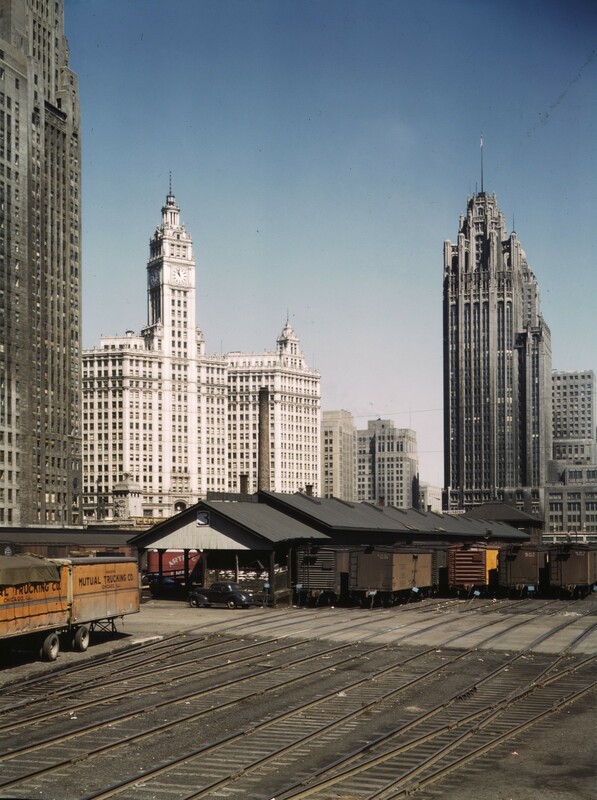 By 1856, the site was home to freight terminals and the Illinois Central Railroad’s enormous complex of tracks–symbols of Chicago’s industrial might. Towering grain elevators along the river gave rise to one of Chicago’s nicknames, “Stacker of Wheat.” They were the first “skyscrapers” to punctuate our landscape. 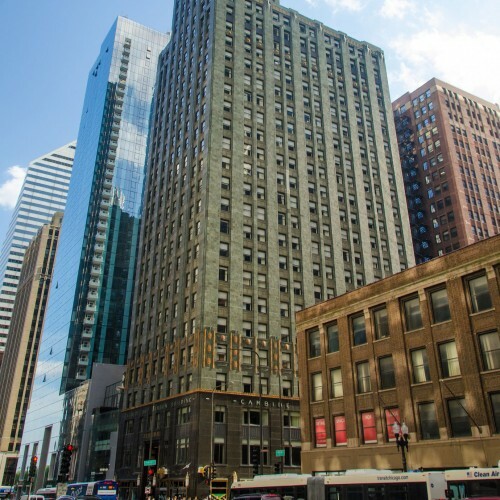 By the time the last 19th century grain elevator was demolished in 1943, it coexisted with true skyscrapers, like the Art Deco-inspired 333 N. Michigan at the corner of Wacker and Michigan. The 1960s meant more change. 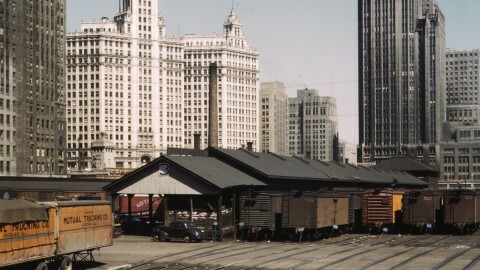 In 1966, the Illinois Supreme Court ruled that the Illinois Central Railroad not only owned the land, but also held the right to build on the space above the site. 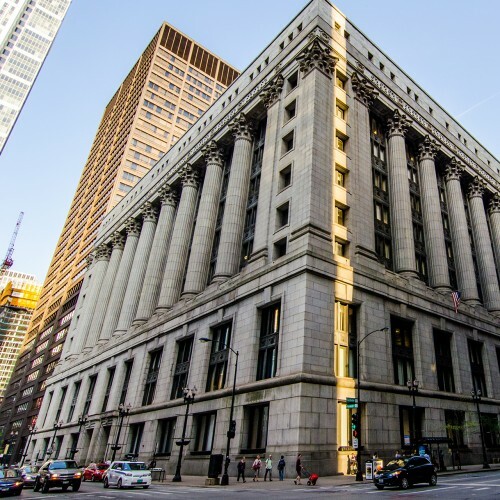 After the ruling, the railroad promptly sold the air rights to developers. 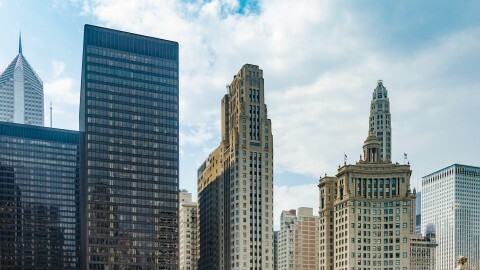 Planning began for the Illinois Center, which Mayor Richard J. Daley proclaimed as the “greatest real estate deal in history.” Newspaper articles from the early 1970s overflowed with optimistic and forward-thinking numbers: 83 acres, 19 to 25 buildings, a daytime population of 80,000 people, 15,250 apartments, 4,500 hotel rooms, $37 million in revenue per acre. 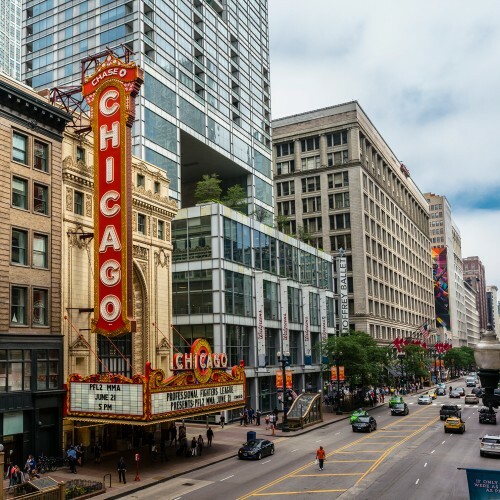 The infrastructure plans were overwhelming, including the rerouting of Lake Shore Drive, an extension of Wacker Drive and addition of many layers of walkways, retail, parking and underground roads, while still accommodating the railroad tracks. 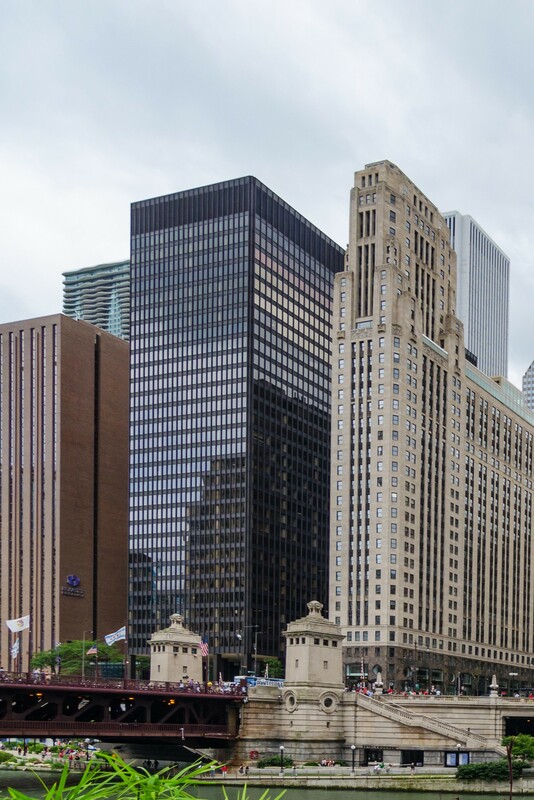 The Office of Mies van der Rohe was selected to design the master plan for the office and hotel space on the westernmost 15 acres of the parcel, which would include 111 East Wacker. 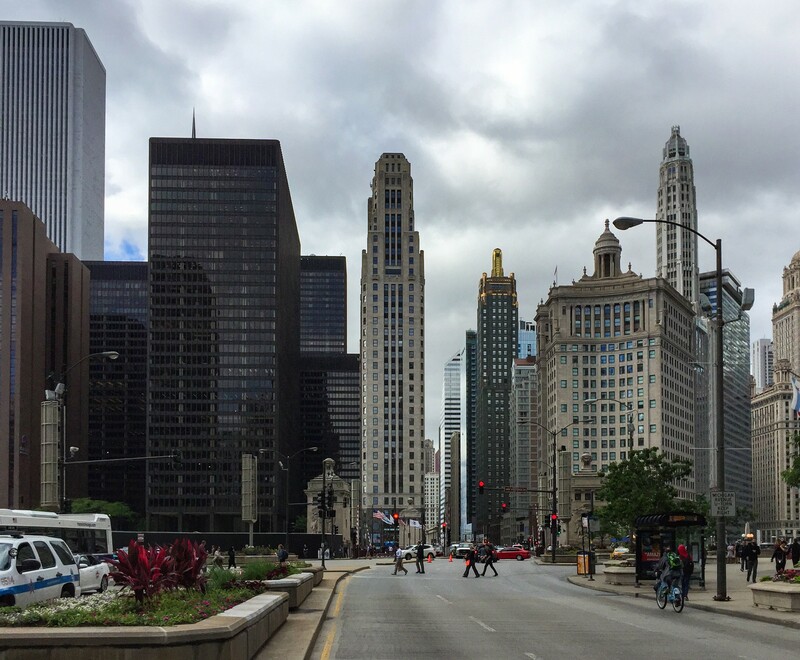 Mies said, ‘Not yesterday, not tomorrow, only today can be given form.’ Here at the DuSable Bridge, several ‘todays’ share space. 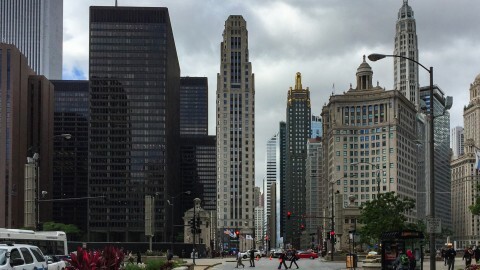 The 1920s Beaux Arts vision of our city at this intersection has a thread of Modernist structures running through it on both sides of the river, with Illinois Center accenting the south bank. 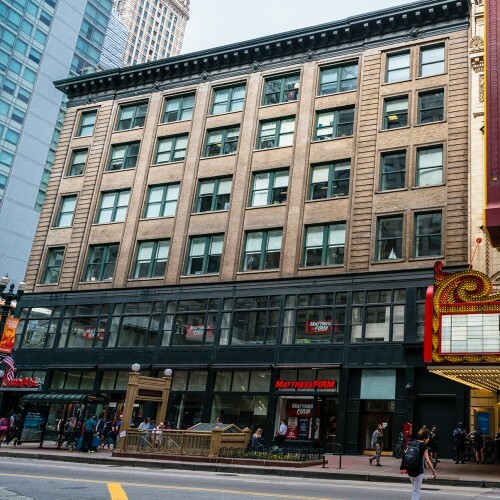 Our 1920s and our 1960s buildings are wonderful counterpoints to one another, and show how architecture, and our vision of our city, continue to change. An emphasis on volume – spaces enclosed by thin planes of glass – as opposed to a solid mass of brick or stone. Instead of a typical symmetrical exterior with a large central opening, the building has a series of columns that form a more regular façade. Instead of applied ornament, the beauty of the building comes in the elegance of the materials, the technical perfection in which they are assembled, and the fine proportions of the space. 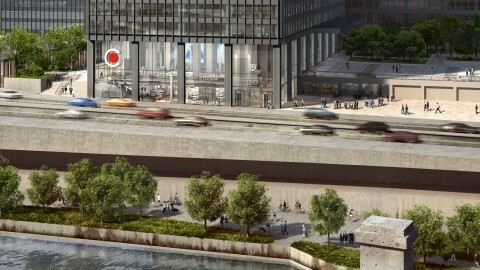 111 East Wacker celebrates the beauty of industrial materials on a site that was once dedicated to industry. Mies’ work and careful details transformed basic structure into high art. 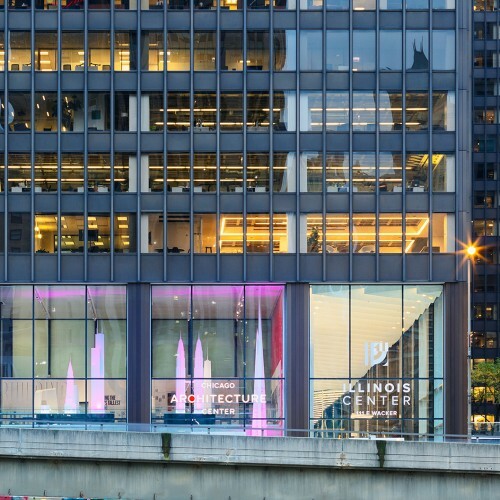 The building shares the hallmarks with his other 1960s Chicago structures, including Federal Center and the AMA Plaza: exposed base columns, exterior curtain walls made of steel beams and glass and a bronze anodized aluminum exterior with tinted windows. Mies died in 1969, just a year before the building opened. 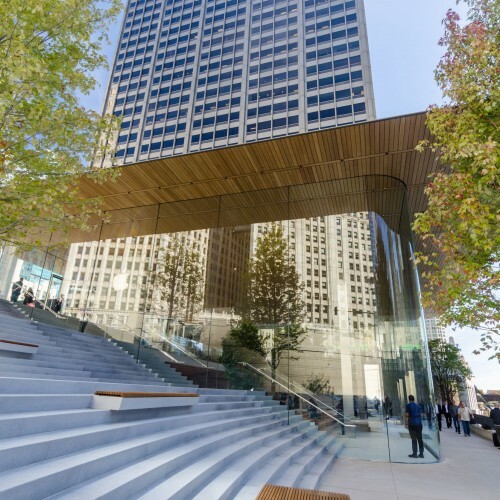 Joseph Fujikawa, one of the partners in The Office of Mies van der Rohe, oversaw its completion. 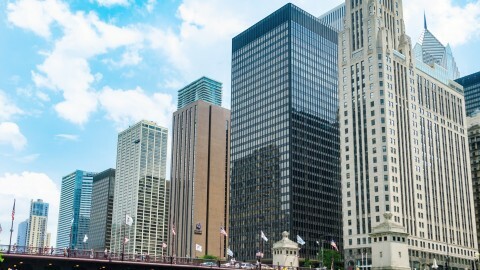 Its sibling building, Two Illinois Center, came in 1973. 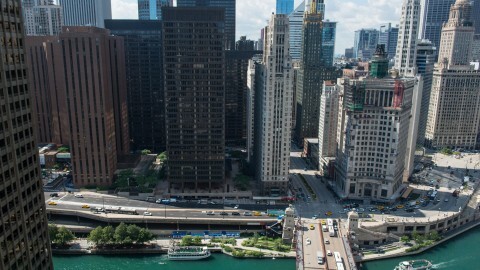 There are three levels of Wacker Drive: Upper Wacker, Lower Wacker, and Lower Lower Wacker Drive—site of one of the city’s impound lots, where towed cars are stored. The trains that came through the Illinois Central yards in 1856 traveled on a trestle located 100 yards offshore, over the waves of Lake Michigan. Clark Kent once worked at 111 East Wacker. The building’s lobby was turned into “The Daily Planet” to film 2016’s Batman v. Superman: Dawn of Justice. 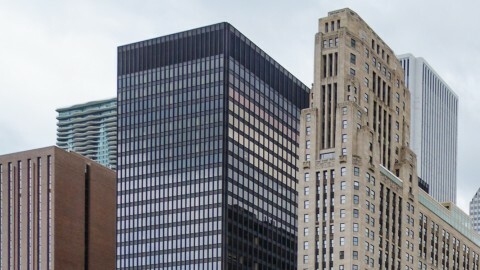 The eastern portion of the air rights land split off from Illinois Center in 2002 to become Lakeshore East, which is home to many residential towers, including 340 On The Park, Aqua and the currently under construction Vista Tower. Today, one can hardly imagine this location as a 19th century U.S. Army fort, a grain terminal or a railyard. 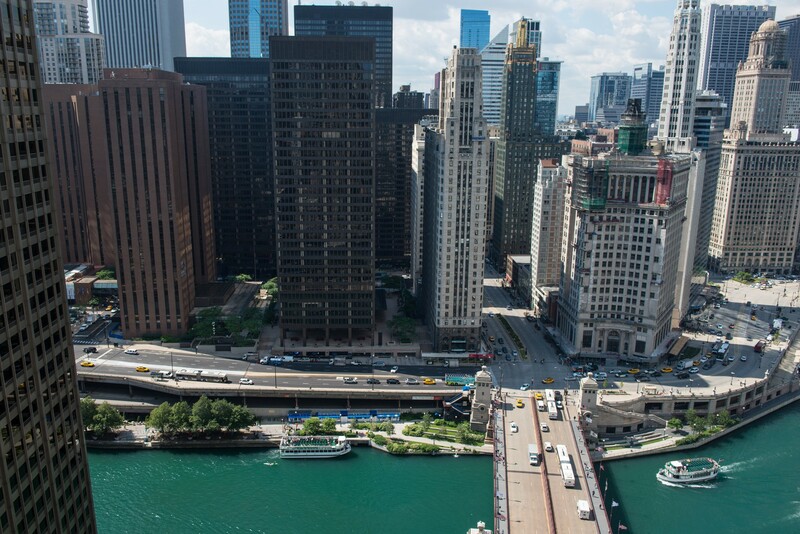 More than 20 residential and commercial towers—tens of thousands of apartments and hotel rooms—share the neighborhood around 111 East Wacker. A nearby elementary school, park and retail spaces also indicate the ever-changing nature of the river and downtown. 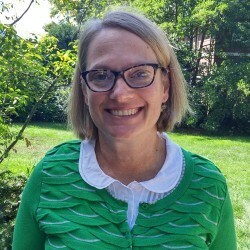 Thanks to Susan Frost, CAF docent, class of 2015, for researching and writing this story.